Measures: Width: 8 in/ 20 cm Height 13.7 in/ 32 cm Depth; 4 in/ 10 cm Weight: 4,5 Kg / 10 lb 1-light bulb E-27, 60w, good working condition/European wiring. 144/ 18 sets of 8 glass tubes each in 2 layers Also have macthing chandeliers and flush mounts Your item will be carefully packed. Assembly required. Bulbs not included. Used. Excellent condition, circa 1970. Also have a matching chandelier. Modernist pair of glass tube sconces by Doria on a polished chrome armature. Each sconce has two sockets. Rewired for use in the USA. Currently 2 pairs available, $3400 pair. Mid-Century 1950s hand-painted and beautifully carved Italian sconces with two candle stick holders on each sconce. 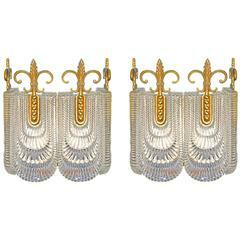 1950s Stilux wall sconce, brass base and white glass.